Following my visit to Jacky Blot this morning, this afternoon was an opportunity to taste the 2008s at two of Vouvray's top producers – Domaine Huet and Bernard Fouquet. After a brief look at the new tasting room and offices, currently under construction and due to be finished in the early part of 2009, I settled down to taste the 2008s with Jean-Bernard Berthomé, chef de culture and chef de cave. Noël Pinguet was busy undertaking an intensive English course. It is important to bear in mind that my comments and impressions are on unfinished wines, which will certainly change before they are bottled. Jean-Bernard: “2008 was a small vintage in volume. We lost 50% of the crop because of the attack of mildew that followed the storm of the afternoon of Saturday 31st May*. I sprayed about half of our vines on the Friday and the Saturday morning then the storm arrived and we couldn’t get back onto the vineyards. There was virtually no mildew in the vines that had been protected, where they hadn’t been sprayed we lost nearly the whole crop. “In the 10 ha that were fully protected – essentially Le Mont – we harvested 45 hl/ha. In another 10, including half of the Clos du Bourg, we made 20 hl/ha, while for the last 10 ha, mainly Le Haut Lieu we could make 5 hl/ha because of the mildew. However, in quality there is a very interesting balance between the sugar and the acidity. As usual the wines will be bottled early – in late-March/April – to keep their fruit. Of the two secs I preferred the more racier, more mineral Clos du Bourg with more finesse, although leaner than Le Haut-Lieu. There are two demi-secs – again one from Le Haut-Lieu, focussing on the fruit – citric and green apple, and Le Mont, which is more pineapple and grapefruit. Once again Le-Haut Lieu was less complex with a greater emphasis on the fruit, with Le Mont being finer and more delicate. 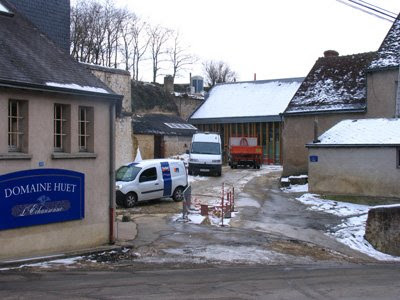 Le Haut-Lieu has around 25-30 gms of residual sugar, while Le Mont has around 40. A precise analysis isn't yet available as the final blend is yet to be made. There are three moelleux in 2008 – one from each of the famous parcels. First up Le Haut-Lieu with 45 gms of residual sugar with some attractive touches of honey, citric flavours and quite marked acidity in the finish. With 60 gms residual Clos du Bourg is richer and riper with more dried fruits – fruits confits – as well as cooked apple. 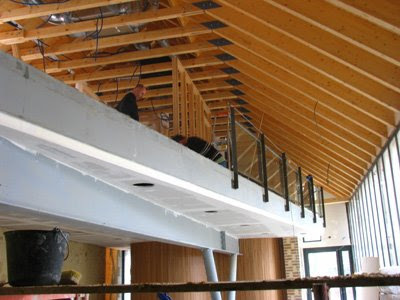 Will need more time than Le Haut-Lieu to show its paces. Jean-Bernard: “We nearly always finish the vendange with Le Mont with its clay and flint soil. This has 65 gms of residual sugar, 6 gms of acidity and 12.5% alc.” This has lovely vivacity, freshness and a thrilling balance of fruit and acidity. “Plus tonique,” says Jean-Bernard of the acidity. “This is my coup de coeur of the vintage.” I can see what he means but to me the Clos du Bourg ‘sec’ and Le Mont demi-sec are also very promising. We then moved onto to taste the 2007s with a couple of pétillants providing the transition. Firstly the lightly golden 2001 with acacia honey flavours, some bottle evolution and apple freshness in the finish. I was quite surprised when Jean-Bernard told me that this has 15 grams of residual sugar. The liqueur d’expedition coming from the Le Mont 2001. Then the more complex and finer Reserve 1998 with aromas of toast and brioche, honey on the palate and a long fresh finish. Both can be happily kept, especially the 1998, for a number a years. On New Year’s Eve we drank our last bottle of the 1999 pétillant – delicious. I have been fortunate to drink the 1959 and 1937 mousseux – both memorable experiences and with no reason to believe in either case that the wines was on its last legs, although the 1937 was only lightly sparkling. We tasted the three 2007 secs. My favourite was the well–balanced Clos du Bourg (13% alc, 7 gms rs and 5.5 acidity) with its attractive weight and floral and honeyed hints. Jean-Bernard thought that this might be beginning to close up – it is certainly not expressive on the nose at the moment. Le Mont was more mineral – plus tonique, while Le Haut-Lieu more apple flavoured. The two demi-secs were lovely and both more open and expressive than the secs. Le Haut-Lieu with 21 gms of residual has attractive honey and pear flavours. The emphasis here is on the fruit, while Le Mont 2007 with acacia honey aromas is more mineral and again has more finesse. The last 2007 was one of the few moelleux made in Vouvray that year – Le Clos du Bourg. It has 45 gms of sugar remaining with a lovely balance of honey and mineral. Jean-Bernard noticed hints of torrefaction. At a low level of sweetness for a moelleux this should be easier to match with a range of dishes than super-rich sweet wines from more generous vintages. Certainly as an aperitif, with blue cheeses but also with rich pork dishes – the classic pork and prunes combination from Tours – or chicken in a rich cream sauce. Next we tasted the 2006 Moelleux Clos du Bourg 1er Tri with 65 gms of residual sugar, 12.5% alc and 4.5 acidity. Light gold colour, honeyed quite rich nose of orange peel and barley sugar, however, there is slight dilution in the finish. This is an indication that because of the weather broke in late-September, the 2006s were never able to fulfil their potential as the grapes had to be picked quickly before widespread rot set in. 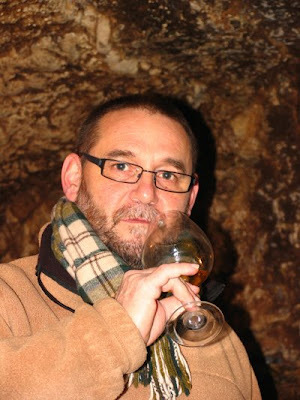 Then Jean-Bernard produced a curiosity that he said had never been sold – a 1993 1er Tri Moelleux from Le Haut-Lieu. This was a fascinating wine from a moderate vintage – burnished gold colour, barley sugar, caramel, some oxidation and quite marked acidity in the finish. We finished with the 1996 1er tri Moelleux Le Mont – entirely from passerillage (sun dried grapes). This is a lovely wine ¬– wonderful delicacy and finesse with honeyed and spicy flavours (Jean-Bernard noted ginger) and beautifully balanced. As I left Jean-Bernard he told me to say hello to Bernard, who he has known for years as they were in primary school together. 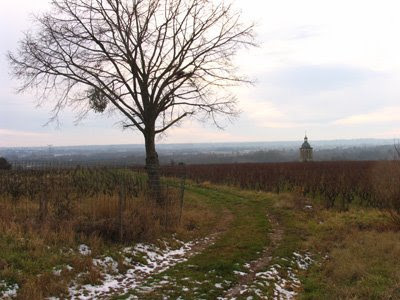 Bernard’s cellars are in the Vallée de Nouy just up from the entrance to the Clos Baudoin. Bernard was one of the lucky ones in 2008 as he sprayed his vines against mildew just before the storm of the 31st May, so he avoided the virulent outbreak of mildew that followed the storm. We tasted in Bernard’s cellars. It was not easy making sure that aromas picked up during tasting were from the wine or from the cellar. As the wines all tasted clean, I ascribed any mustiness to the cellar and not to the wines. We tasted 2008 and 2007 in parallel. The attractively soft Silex 2008, a sec, was the first – mineral with a hint of honey, precise and persistent. (It has 13.2% alc, 6 gms of residual and 5.0 total acidity.) The 2007 Silex (13% alc, 6 gms rs and 4.8 acidity) had good length but was less exciting than the 2008. Bernard detected petrol aromas. Next a lovely 2008 Les Giraudières demi-sec –honeyed with crisp acidity with good length. It’s the thrilling mix of sweetness and austerity that makes top Vouvray so good and why a still demi-sec is the classic Vouvray style. Once again the 2007 Les Giraudières was less exciting than the unfinished 2008. Analytically very similar to the 2008 – 26 gms of residual against 25, almost identical acidity but at 12% half a degree of alcohol less. “The 2008s have more subtlety,” said Bernard. It may also be that some 2007s are closing up and there is the excitement of tasting the latest vintage. Bernard: “Les Giraudières is in the same part of the première côte as Le Mont (Huet) and Philippe Foreau’s vines.” This is between the Rue de la la Croix Buisée in the west and La Vallée Chartier in the east. We then backtracked in sweetness to Le Marigny sec, which is fermented in 400 litre barrels – 1/3 new, 1/3 one wine, 1/3 two wines – spending 10 months in wood before bottling in July. The 2007 has attractive weight and length with a touch of wood. Ideally needs another two or three years in bottle. The 2008 is still fermenting. Last 2008 was a potentially lovely moelleux picked with a potential of 17.1% alc. It has 11.6% alc and 90 gms of residual. Currently it has flavours of grapefruit and honey and a precise mineral finish. At the end of picking the 2008s Bernard left a small parcel of grapes to see how they would develop but rain in early November ruined them. Three older sweet wines to finish with starting with the 2002 Plan de Jean (100 gms rs, 6.5 acidity), a vineyard on clay and limestone and showed why 2002 is such a lovely vintage. Beautifully balanced with rich honeyed fruit and a vivid mineral finish. Bernard compared the 2002 with 1996, saying that it was better than the 1995. Then we looked at two from 2003. Le Marigny with 160 gms of rs had rich butterscotch flavours with good acidity for this heat wave year. “With grassed over vineyards you always get good acidity,” commented Bernard. Lastly the even more powerful Cuvée Alexandre – a big bruiser with 200 gms of rs – richer than Le Marigny yes but less interesting and less complex. Bernard: “In 2003 we started picking the moelleux first and finished with the sec. It was so hot that I would leave the grapes in the coolness of the cellar overnight and then press the next morning. Bernard said how much he liked the wines of Frantz Saumon and Xavier Weiskopff in Montlouis and the number of other new producers, like Stéphane Cossais, in that appellation also making exciting wine. I asked Bernard whether there are similar new discoveries to make in Vouvray. He confirmed my impression that it isn’t the same in Vouvray. He did, however, say I should taste the Vouvrays of Sébastien Brunet in Chançay. Brunet will be at the Salon des Vins de Loire in the main hall at stand L-M 306. I have long counted Bernard Fouquet as one of Vouvray’s top producers. Robert Parker’s recently published 7th edition of the Wine Buyer’s Guide lists Bernard as an ‘outstanding’ producer along with Domaine Huet and Philippe Foreau. I’m not going to argue with that. What's your take on this, Jim? Will they forgo the Sec designation at bottling time? Work a little magic in the cellar to blend down the RS? Or just go ahead with Sec labeling and try to get the wines past the INAO as is? Merci beaucoup Johan. J'ai mis le lien en Jim's Loire 15.1.2009. David. My impression from Jean-Bernard is that this is the balance they want and that this is much more important than using a little 'magic' in the cellar to comply with the sec requirements. I had the same impression from reading your post. I didn't really expect "magic" in the cellar at Huet, but I remain curious as to how they'll handle labeling. They could do as some producers like Champalou and go for sec-tendre. A later comment Jim - was reading your notes after posting my thoughts on the 2008s and 2007s earlier this week. My comment concerns the 1993 Haut Lieu Première Trie having apparently never been sold. I still have 6 bottles in the cellar, having bought them (probably) at the domaine in the summer 2003. I also picked up an extra bottle somewhere along the way from a UK source - possibly Stone, Vin & Sun - which I drank in 2003. Didn't find any oxidation then. Maybe I should return to one of my others sooner rather than later? Hello Jim - I am a winemaker from Oregon and will be traveling in the Loire in a couple of weeks to explore Chenin blanc. I'm trying to reach a number of the same producers you visited. Would you be able to email me and possibly help me out with contact information? Cabernet Franc: wot a lusty grape!